Investigative reporter and innovator Chuck Lewis interviewed and taped journalists who played a role in some of the biggest stories of the past 60 years – national ‘moments of truth,’ as Lewis calls them. The result, ‘Investigating Power,’ is a tribute to good reporting and a reminder of how powerful the press can be when it does what is supposed to do. In 2005, I began conducting research on my sixth book, The Future of Truth: Power, the News Media and the Public’s Right to Know. Piqued by how easily the national news media had been misled in the post-9/11 period by the Bush administration in the lead-up to the Iraq War, my researchers and I at the Fund for Independence in Journalism, a nonprofit legal defense and endowment support organization I co-founded and led, prepared a 380,000-word, Boolean-searchable chronology called Iraq: The War Card. It included every Iraq-related national security-related utterance by eight top officials for two calendar years after 9/11, juxtaposed against the more than 50 books, commission and other government reports published between 2003 and 2008 illuminating what was actually known inside the U.S. government, versus what was said publicly. We found that in the two years following September 11, 2001, President George W. Bush and seven of his administration’s top officials had made at least 935 false statements about the national security threat posed by Iraq. The number of these erroneous exhortations had spiked upwards at politically strategic moments – specifically before the October 2002 Congressional vote on the war, and between January and March 2003, from then-Secretary of State Colin Powell’s United Nations presentation to the invasion itself. As we all know too well now, the cumulative effect of these false statements – amplified by thousands of uncritical news stories and broadcasts – was massive, and much of the saturation media coverage provided additional, “independent” validation of the Bush administration’s misstatements about Iraq. This extensive research and analysis was undertaken specifically for The Future of Truth and given to the Center for Public Integrity, which published the findings – covered heavily by the national and international news media – just before the five-year anniversary of the U.S. invasion of Iraq. I wrote, with Mark Reading-Smith, the overview story entitled, False Pretenses. Wondering how the Iraq War situation compared with the past, and apparently having masochistic tendencies, my researchers and I then began systematically examining the most mortally consequential, deadly deceptions by government and companies, the origins and trajectories of public relations and propaganda, and the truth-telling capacity of journalists and their news organizations over the past century. In this brave new warp speed world, in which the number of public relations specialists has doubled (according to Robert McChesney and John Nichols) and the number of newspapers reporters and editors has decreased by more than a third in the past 20 years, in which sound bites are getting shorter and independent, in-depth reporting rarer, how can the American people know the real-time truth about those in power? To what extent have we ever really known the real-time truth about those in power? And it was against this intellectual backdrop that I then decided that it was necessary in terms of historic context to closely examine national “moments of truth” in contemporary U.S. history, in which news organizations, through their independent news reporting, had exposed egregious abuses of power in close to real time. We are talking about some of the iconic, triumphal reporting in the contemporary history of our profession, all of which, of course, are also contentious and debated and analyzed and perhaps will be ad nauseam. Nonetheless, in my view, there were no finer moments emblematic of the essential role of journalists than in covering the anti-Communist demagoguery of Senator Joseph McCarthy in the 1952-54 period; exposing institutionalized racism in the South and the civil rights struggle to change it between 1954 and 1968; exposing the gross representations and civilian atrocities committed by the U.S. government during the Vietnam War; revealing the massive abuses of power in what became known as the Watergate scandal; exposing the various contemptible abuses of corporate power (e.g. tobacco, lead paint, asbestos, etc.) over many decades in which millions of Americans died prematurely and unnecessarily; and exposing the various abuses of U.S. power in post 9/11 America. All of these great national moments have a few key ingredients in common, besides immensely talented journalists. And that is time, publishers of strong spine and the willingness to commit sufficient resources to such truth telling. How many newspaper editors today oversee a complicated political scandal for a year and a half, as Washington Post city editor Barry Sussman did full-time following the Watergate break-in, assigning and overseeing the daily reporting of two young Metro reporters named Bob Woodward and Carl Bernstein 40 years ago? 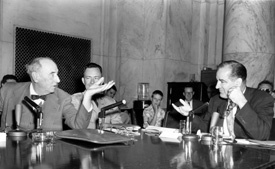 How many reporters do daily in-depth coverage of a high voltage political drama as Murrey Marder did for four full years at the Washington Post, his seminal stories ultimately unveiling McCarthy’s bombast and irresponsibility and setting up the famous McCarthy-Army hearings. How many writers immerse for years in a specialized subject area, such as the environmental scientific milieu then in its infancy, as Rachel Carson did prior to her New Yorker stories and her timeless classic work, Silent Spring, as Robert Caro has done for 35 years about the same subject with the same publisher? Lord Acton, the British historian, once said: “Life is a matter of application.” The bottom line is the bottom line, namely that great, original reporting takes time, institutional fortitude and commitment and costs money, all of which are unfortunately in short supply these days. Against this backdrop, in close consultation with many veteran journalists, and after substantial historic research, I began assembling an initial list of some of the most notable, living national journalists since 1950 about their lives and their important work – fully recognizing how subjective such an exercise necessarily is, but also realizing that I had to start somewhere. Around this time, I also decided, in part because many of these reporters and editors were of advanced age, that the interviews should not be audio recorded but should be preserved for posterity on the highest quality, high definition video – literally George Lucas’ high def video, the kind he was using at the time cinematically. It took most of 2006 for me to secure sufficient funding to conduct the videotaped conversations, approximately $300,000 (professional camera crews were $6,000 a day). Once that had occurred, it became clear that this had now moved beyond mere book-related research – that it must also become a stand alone, ongoing oral history project, multimedia and online accessible. After the Investigating Power interviews were conducted and recorded on video in three cities in 2007 and 2008, they were transcribed while the first iteration of a website was designed by Tarek Anandan. Between May 2010 and late April 2012, over 100 hours of two-camera F900 high definition video material was screened and distilled into 51 produced videos (42 conversations and nine short documentaries) by project senior producer Margaret Ebrahim, producer/editor Ted Roach and yours truly. With more than 100 hours of footage, we wrestled with what exactly to focus on. The first impulse was to select one or two video conversations per journalist and save the rest of the footage for a documentary to be produced at a later date. But there was so much wonderful history about journalism in the 100-plus hours of raw video material that my producers and I decided to also incorporate short documentaries into the overall presentation, in addition to the individual conversations. We approached the documentaries as first-person testimonials about significant moments in history when journalism spoke “truth to power.” The video testimonies were interwoven with historical footage and photographs as well as music. There also are dozens of video conversations between interviewed journalists and I on specific topics, including the state of journalism, how important national stories were approached and what it took to break important news. Everyone involved came to the production process with different experiences and sensibilities. As a longtime investigative reporter, who had been a television news producer during the late 1970s and 1980s at ABC News and CBS News 60 Minutes, my sensibilities were firmly planted in traditional broadcast journalism. Ebrahim too was a journalist and came from the same broadcast news background, but she also had a documentary background in more recent years. Roach was an MFA candidate at American University’s Film and Media Arts program while he was working on the project, and viewed himself more as a documentary filmmaker, rather than a journalist. At times, melding these different sensibilities into one for this project and the web was challenging. An example of this challenge surfaced over sound effects. In some of the documentaries subtle sound effects were incorporated over the historical photographs. In one particular case, there was a photograph of a U.S. Army Huey helicopter flying over Vietnam during the Vietnam War. Roach found an audio recording of a Huey helicopter flying over Vietnam during the war. He used this sound over the photo, a common practice for filmmakers. I felt that if sound was to be used, it must have been captured at the exact time the photograph was taken. In the end, the sound effect was taken out of the documentary. Originally, all the documentaries had music and sound effects laced through out the stories. Both Ebrahim and Roach felt that music and sound effects added to the emotion and authenticity of the short films. But I felt music was a distraction from what the journalists were saying in the interviews and that sound effects were an anathema to honest and transparent journalism. After several heated discussions, we generally settled on subtle, unobtrusive music at the beginning and the end of the films and stripped almost all “unnatural” sound effects from the documentaries. It was difficult, to say the least, trying to blend both the journalism and film sensibilities for this project. Five years later, after the initial idea, we have now Investigating Power, a unique, online, oral history multimedia presentation which is an imperfect, incomplete work-in-progress that will improve in the years ahead. It was made possible through the efforts of 22 researchers, writers, editors and producers. We have been very fortunate to have had the institutional fortitude and commitment of three nonprofit organizations I founded and have led – the Fund for Independence in Journalism, the Center for Public Integrity, and the Investigative Reporting Workshop – and approximately 22 foundation and individual donors, to whom we are very grateful. And special thanks also to the National Press Club Journalism Institute, the sponsor of an April 25th gathering on the public release of the project. All 51 conversations and produced mini-doc videos can be separately accessed on YouTube and Vimeo. Investigating Power is a stand-alone website which will become a permanent linked feature of the Center and the Workshop sites, and the raw interviews will be used in a companion documentary or even series of documentaries which will hopefully be produced after the early 2013 publication of the book. There is also publisher interest in a separate but also related book which might also be called Investigating Power, which I would edit, profiling the journalists and excerpting from my conversations with these remarkable journalists. This information will all be readily accessible to journalists and non-journalists alike, throughout the U.S. and the world. And journalism professors will be able to utilize this rich material in their classrooms for their students’ edification. Finally, it is my hope to continue to interview the most important journalists of our time. By 2015, I hope to have increased the number of folks interviewed, produced, edited and profiled online to at least 40 people. As we move further into the 21st century, it is increasingly important that we hold those in government and corporate (and other) power accountable, and the traditional hunter-gatherer, reporter realm will increasingly benefit from the most knowledgeable and credible academic experts, respectable non-governmental organization (NGO) researchers, trustworthy whistleblowers and the increasingly evident wisdom and constantly improving technologies of the crowd. Charles Lewis is the founding executive editor of the Investigative Reporting Workshop at American University in Washington, a journalism professor at AU, and the founder and executive director for the first 15 years of the Center for Public Integrity.